The handwritten letter blew past auction estimates, selling for well over $2 million. The page-and-a-half letter details the legendary physicist's feelings about Judaism and God. A letter written in German by Albert Einstein in 1954 sold at auction for 2.4 million euros ($2.1 million) on Tuesday. Experts at Christie's auction house in New York had previously estimated the so-called "God letter" could sell for up to $1.5 million. "This remarkably candid, private letter was written a year before Einstein's death and remains the most fully articulated expression of his religious and philosophical views," said Christie's in a statement. The missive is referred to as the "God letter" because it addresses how Einstein felt about the characterization of God and Judaism in a then-recently published book on the subject by Eric Gutkind. 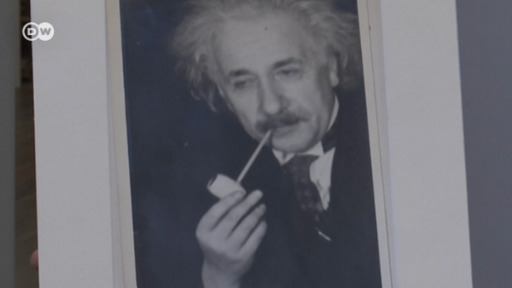 Gutkind, like Einstein, was a German-born Jew who had fled the Nazis to the United States. "The Jewish people to whom I gladly belong, and in whose mentality I feel profoundly anchored, still for me does not have any different kind of dignity from all other peoples," writes Einstein. "The word God is for me nothing but the expression of and product of human weaknesses, the Bible a collection of venerable but still rather primitive legends,” Einstein tells Gutkind. "No interpretation, no matter how subtle, can (for me) change anything about this." Gutkind's book "Choose Life: The biblical Call to Revolt" characterizes Judaism and Israel as ethically untouchable entities. Einstein writes in the letter than while he identified as Jewish and was proud to be such, he was disillusioned with Judaism, calling it a "primitive superstition." Specifically, Einstein did not believe that if there was a God, he answered individual prayers and intervened directly in human affairs. The "God letter" passed into the hands of Gutkind's heirs, who kept the letter until it was sold at auction in 2008 for $404,000. An attempt to sell the letter on eBay for $3 million in 2012 evidently failed, as Christie's confirmed that Tuesday's seller was the same buyer from 2008. Notes from Einsteinroutinely fetch high prices, the most expensive of which was a 1939 letter to then-US President Franklin Roosevelt. In that letter, Einstein described "the construction of extremely powerful bombs," thought to denote the beginning of the Manhattan Project. It sold in 2002 for $2.1 million. For Albert Einstein, it turns out the law of attraction was relative. A handwritten note by the Nobel-winning scientist, written to a young woman who apparently caught his eye during a trip to Italy, is set to go on sale at a Jerusalem auction.